FORT MYERS, Fla. — Governor DeSantis announced today $1.75 million to expand apprenticeship programs across Florida. CareerSource, a statewide program for workforce development across the state, created and funded the Apprenticeship Expansion Grants. 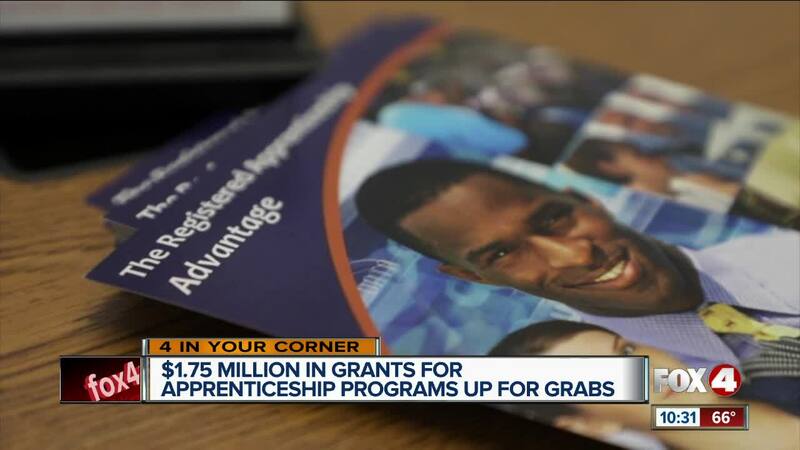 The grants will go to Registered Apprenticeship or pre-apprenticeship programs and cover costs such as on-the-job-training, related instruction, curriculum development and outreach to underrepresented communities. “We can pick up some of the support that goes along with it. Whether that be tools, maybe transportation, development of curriculum, those sort of things are the benefits not only to the business but the individual going through the apprenticeship program,” said Jim Wall, communications director of CareerSource Southwest Florida. Graydon Bullard graduated from Tri-County Apprenticeship Academy in May 2018 to start his own HVAC company. Bullard believes apprenticeship programs balance mastering the practice and learning the basics. “You have that foundation. And after that foundation, you can now apply what you’ve learned in class, in the field. And you’re just going to see yourself excelling beyond means,” Bullard said. Christine Sardina, Executive Director of Tri-County Apprenticeship Academy, says it’s difficult in standard classrooms for students to get hands-on experience. Wall says workers in trade practices can earn a salary of up to $50,000 to $60,000. “We need to continually reinforce that there are high-paying jobs within the trades industry which is more and more getting computerized,” Wall said. Bullard feels the benefits himself, now serving over 100 customers for his business. “Being my own business owner is good for me. Since I’ve opened, I mean I have so [many] customers, it’s all word of mouth. It’s pretty much coming out real, real good for me,” Bullard said. CareerSource is offering a training course for business leaders to educate themselves about the funding available to them. The session is on Wednesday, April 10, from 8:30 a.m. to 10:00 a.m.